Posted 26th April 2012 by Myfanwy in Advice, Features. FixMyTransport gives individual passengers the tools they need to get their problems heard. But the site can also be effective for transport pressure groups and campaigns, and we are very happy to see it being used in that way. Here are some ideas for how transport groups can use FixMyTransport. A profile doesn’t have to belong to a person – it can represent your group instead. See, for example, the profile page for Glasgow’s Better Buses campaign. They have used their logo as a userpic. Their profile page gives more information about the campaign, a URL for their website, their Twitter handle, and a list of the FixMyTransport campaigns they support. If you’re a smaller group and you don’t have your own website, this page could even act as your sole web presence. Go to our Browse Issues page, and input your postcode, town or area (or click ‘use my current location’). This will take you to a page with a list of all reports made in that area, and a map. Use the blue controls at the top left corner of the map to zoom in or out, until you can only see the area you campaign within. The list of problem reports will change to reflect the area covered on the map. From that page, click on each report’s title to read it. Once you have a FixMyTransport profile for your group, you can use it to leave a comment on any relevant FixMyTransport problem report. Feel free to link to your site if you think your campaign can help our user. 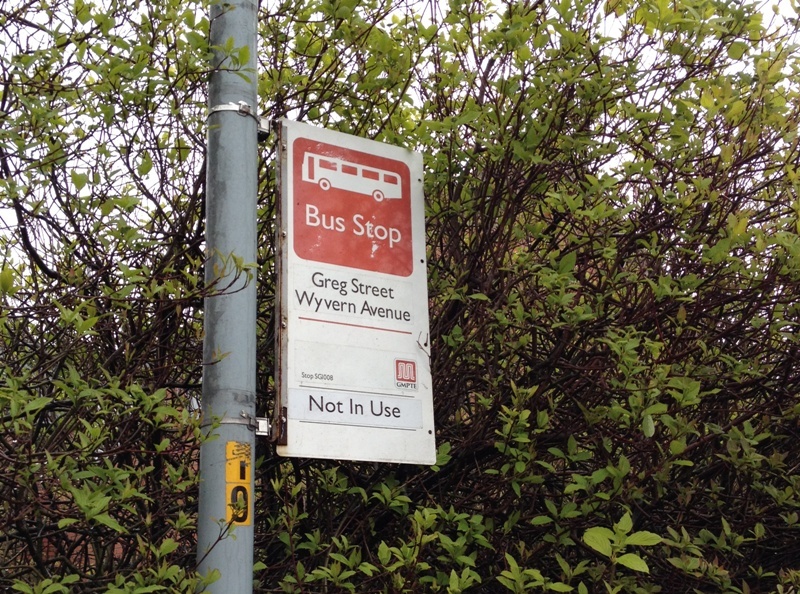 See our recent blog post on how to follow the routes or stops that matter to you. By subscribing, you can be alerted to relevant campaigns as they arise – and comment on them where it’s helpful. You can also use the same technology to feed local problems onto your website: see Lichfield Live for an example: FixMyTransport issues within Lichfield are fed into the right hand column of that page. They’ve written a blog post to explain how to do that, if your site is built on WordPress. 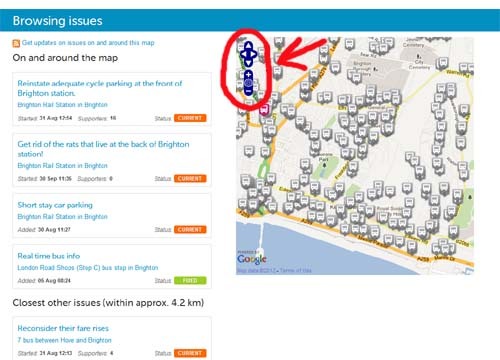 If you can’t find any relevant reports, why not create your own FixMyTransport campaign page? For maximum effect, we recommend focusing on a single issue. Make your request clear, and remember that visitors to the site may not know the background, so explain the relevant issues. Also include a call to action – explicitly ask them to join your campaign by clicking the big green ‘join’ button at the top of your page. Once you’ve created your FixMyTransport campaign, you can tap into all the site’s functionality for spreading the word via social media, inviting comments, and escalating problems to people who can help, like local councillors and transport watchdogs. Don’t forget to announce the URL via all your usual channels – your own website, your newsletter, etc (NB, if your URL is rather unwieldy, you may wish to use a URL-shortening service such as Tinyurl.com). 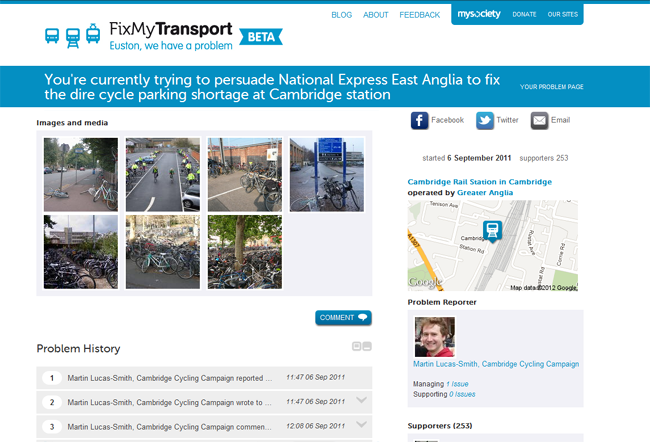 The image at the top of this post shows the Cambridge Cycling Campaign’s page on FixMyTransport: it has the most supporters of any of our reports to date (253 at the time of writing). They are protesting about the lack of cycle parking at Cambridge railway station. They’ve added several photographs to show the problem graphically. A picture speaks a thousand words! They’ve stuck to one issue, and explained it clearly. They then spread the word, via their newsletter, website, Twitter and Facebook. Each time anyone comments on the page, their update is emailed to every supporter. These emails act as a reminder to supporters, and keeps them coming back. When progress is made outside FixMyTransport, it is reported in the comments too, to keep everyone updated. If you’re a transport group who would like further help or guidance as to how to use FixMyTransport, just drop us a line. Posted 19th April 2012 by Myfanwy in Features. One of the most-requested features for FixMyTransport has been the ability to track a specific route or area. We’re extremely happy to report that you can now do just that, with our introduction of Atom feeds. Subscribe to a feed, and you’ll be notified of new transport problem reports when they occur near you, or on a route you care about. In fact, you can now track not just routes and map areas, but specific operators, stops and stations too. We’re hopeful that this will help build communities around shared services. Subscribe to your commuter route, for example, and you’ll not only be the first to know when a problem has arisen, but you’ll also be able to join the campaign and communicate with your fellow passengers on FixMyTransport. 1. Start by searching for your local area: click here. 2. Use the map controls (circled below) to zoom in or out, pan, or scroll until the map covers the area you’re interested in. 3. 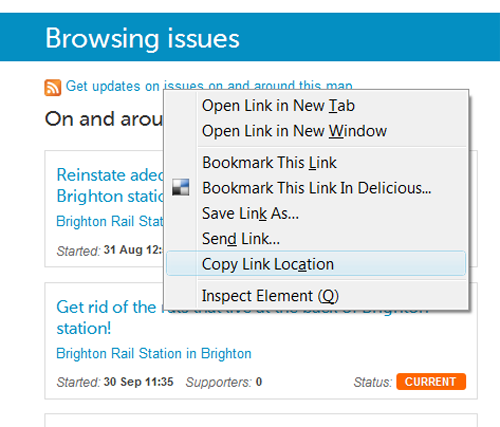 Find the orange feed icon at the top of the relevant list: Right-click on ‘Get updates on issues on and around this map’, and select ‘Copy shortcut’ (in Internet Explorer) or ‘Copy link location’ (in Firefox). This will give you the URL to paste into your feed reader. Don’t use a Reader? Some popular ones are Google Reader, Bloglines, and FeedDemon. If you run a website, you can now also feed content directly to it. We think it’s ideal for local community sites, commuter and transport pressure groups, or any other site with a focus on transport. Just drop us a line on team@fixmytransport.com if you’d like some help. EDITED TO ADD: Lichfield Community media have now written a great post to explain how to add a FixMyTransport feed to a WordPress site. Image by Steve Webel, used with thanks. Posted 11th April 2012 by Myfanwy in FixMyTransport team. The vast majority of the content on FixMyTransport is provided by our users – and that’s what makes it so fascinating. 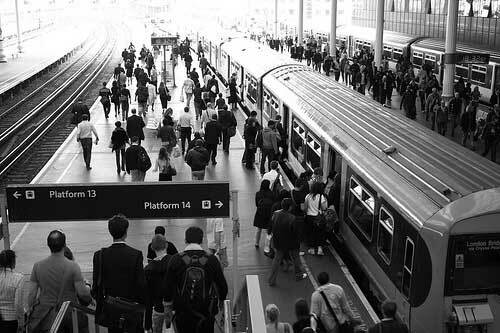 Every day, there’s a new crop of problems to read – some big, some small, and all reflecting the various hassles of trying to negotiate public transport in this country. It may be wrong to glean pleasure from other people’s misfortunes, but the site does make for compulsive reading. That’s because, for the most part, problems are fascinating. They have human interest. And we can all identify with people who had their money swallowed by a ticket machine, or can’t find a seat on their daily commute. If you’ve used FixMyTransport to report a problem yourself, you may have received advice from one of the FixMyTransport team. We call our experts “anoraks”, in a jovial nod to our trainspotter tendencies. 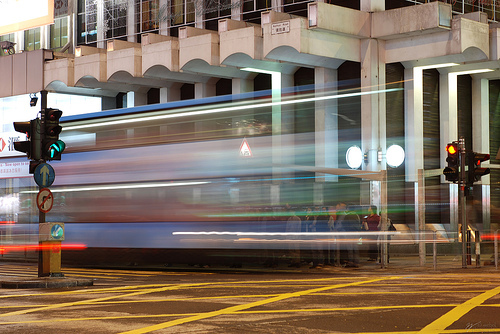 Many of the team are volunteers, chosen for their extensive knowledge of, or passion for, this country’s public transport routes, protocols and idiosyncrasies. The anoraks’ aim is to help you get your problems heard – if you’ve accidentally reported an issue at the wrong place, they’ll reroute it. If the operator fobs you off, they know who to contact next. If you can get help from a specific organisation, they’ll tell you. That’s all great, but of course, our team also has a wealth of knowledge and opinions that don’t get shared in the FixMyTransport arena. Which explains why we set up this blog. We intend this to be a place where we can discuss wider public transport issues, with plenty of room. It probably doesn’t need saying, but opinions expressed here are those of our individual team members, and don’t represent any kind of official FixMyTransport stance – and that’s kind of the point. It’s a place for ideas and discussion. We’d love it if you commented, too, and joined the debate. I’m the first to admit that I myself have only a fraction of the public transport knowledge that our volunteers display. But I’ll also be contributing, generally with news about the site itself, and the most interesting campaigns or trends that emerge. I hope you’ll enjoy visiting, commenting, and getting to know our anoraks a bit better. Don’t forget to subscribe to our RSS feed, if that’s your thing (links are to the right). Image by Charbel Akhras, used with thanks.